Harrogate Hills Riding School – The kindest treatment of the horse is gained through knowledge. Forms for the clinic here. Forms for our Dressage Series (May 5th, May 26th, October 6) here. If you want to be updated when the information is available, just send us an email to info@harrogatehills.com and we’ll send it directly to you! If you’d like to visit the farm, please give us a call 905-473-3847 or send us an email to: lessons@harrogatehills.com. We’d love to show you the facilities and introduce you to the horses and staff. 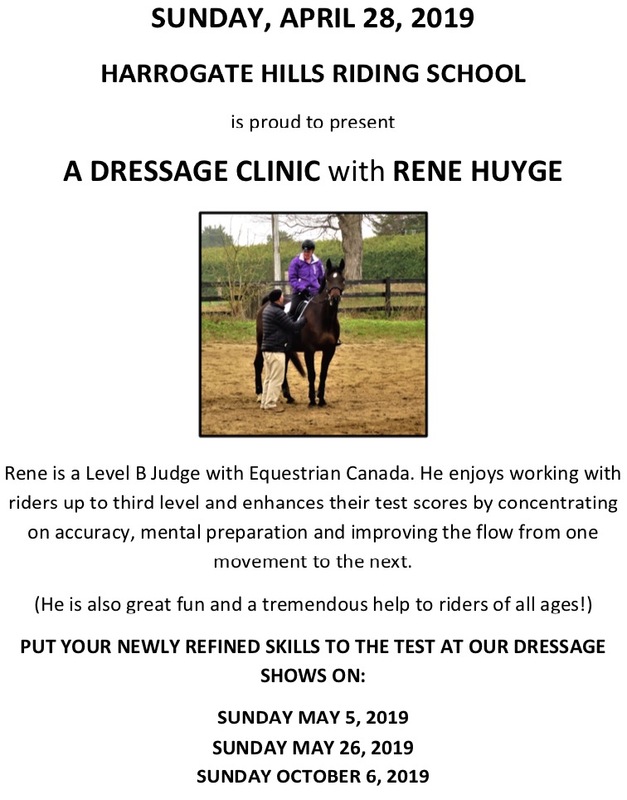 If you’d like to take a FREE assessment ride, so you can decide if horseback riding is something you’d like to pursue, we can arrange that too. If this is the first time you’ve considered horseback riding, we have a guide that can answer some of the questions you probably have. Just fill out the form on this page and we’ll send the free guide right to your inbox. You can find more information about our LESSONS and our SUMMER CAMP by clicking on the tabs or the menu.